Our Nature's Haven is an attractive eco-compact house sitting on a lush property in Ste-Brigitte-de-Laval within a short drive of beautiful Québec City. 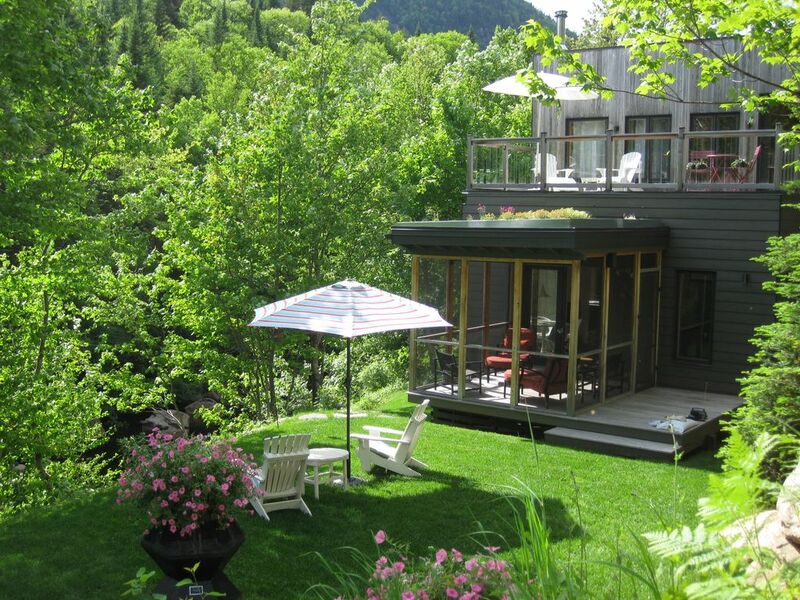 This contemporary house boasts views as well as direct access to a free flowing river with crystal clear water where you can swim or fly fish for small native brook trout or simply enjoy family time, right at your doorstep. You'll experience the sense of peace that one feels around water. Yours to enjoy are a very private nature footpath and stream, landscaped lawn and river views. Although secluded and private, the home is not isolated and sits within an 8-minute ride to town for your daily needs and shopping (supermarket, drugstore, gas station, wine & liquor store, family restaurant, etc.). The house’s striking modern design in such a serene setting offers modern amenities and wonderful indoor-outdoor flow. The three bedrooms on the second floor offer sleeping arrangements for a maximum of 6 persons (4 adults and 2 children_under 12 years old) and give access to a bathroom equipped with in-floor heating. The bathroom on the first floor features a walk-in ceramic shower and also in-floor heating. Airy and inviting, the kitchen has modern amenities. Step out onto the screened porch only feet from the river or lounge on the upper deck overlooking the property. There are plenty of attractions and activities nearby to keep you busy for days. Just minutes away sits Québec City, one of the most beautiful cities in the world named as one of the World Heritage sites from UNESCO. There are museums, the Château Frontenac, gourmet restaurants galore and a thriving cultural scene. Among a score of activities for the summer 2019 in Quebec City is the Festival d'Été de Québec, one of Canada's biggest outdoor musical event which will be held from July 4th to the 14th 2019. The breathtaking Parc National de la Jacques-Cartier is an easy day trip from the property. Also worth a visit are the Indian Reserve Huron Wendat, the Montmorency Falls and Ile d’Orléans. Right here in Sainte-Brigitte sits a beautiful 18-hole golf course The Alpine Golf and Country club. Another golf course, The Mont-Tourbillon, in Lac-Beauport is 15 minutes away. Also, Sainte-Brigitte offers several playgrounds with swings and outdoor amenities for kids. Local hiking trails are also nearby. Oui, nous parlons aussi français. One bathroom with shower only, the other with bath only. Both have in-floor heating. Delightful home in a beautiful setting. Riverfront is a gorgeous spot. It is quiet and embedded in the natural beauty of the hills. The river provides a audio background that soothes, relaxes and clears the mind. A thirty minute drive has you in the heart of Old Quebec City with easy access to the sights, restaurants, and shopping. The home is well appointed, very well outfitted, and a wonderful place to relax and enjoy. Nature’s Haven is both beautiful and spotlessly clean. While the house is fantastic, it is the property and location that makes Nature’s Haven a stand out. Have I said “Wow” yet? The house sits above a roaring stream with breathtaking scenery all around. The grounds are meticulously kept with seating areas, paths and a fire pit. We were a party of 4 and enjoyed all of the above. We spent two days in Quebec City, and two days in Jacques-Cartier Park, each about a 40 minutes drive. Honestly, we Looked forward to our return to our own park. Murielle and Jean were perfect hosts. They provided us with all the information we needed to make our stay enjoyable. The photos do not do justice to this property! If you are looking at this property, just rent it! Look no further. Nous avons eu la chance de séjourner 7 nuits dans ce gîte magnifique, très propre et stratégiquement situé. La jolie rivière qui borde la propriété fait tout le charme de l’endroit. Non seulement on peut s’y baigner, mais on y pêche égalent la truite! L’accueil de nos hôtes, qui n’ont clairement rien ménagé pour rendre cette demeure des plus confortables, a été très chaleureux. Ce petit coin de paradis au cœur de la forêt, parfait pour une famille de 4 personnes, vaut le détour! Bien que situé en pleine nature, il est facile de se ravitailler et la Ville de Québec est aisément accessible. This property is even more amazing than can be captured in pictures. The house is wonderful with many windows, and has an upper sun deck and a screened porch. In addition, the private trail leads to a secluded spot by the river, perfect for happy hour. We loved sleeping with the windows open, being lulled to sleep by the sound of the river below. To top it off, the hosts are warm and gracious. Couldn't be better! Beautiful house and property! The house has a dappled (private) trail leading down to the river. It was unusually hot for Quebec when we were there: 90's, but we would cool off with dips in the water. It is an easy drive to Quebec City for the sights. There is also a supermarket right in St.-Brigitte to pick up fresh food for meals. The kitchen was well-stock with supplies to make relaxing meals at the house after an all day tour around Quebec. All-in-all, had a wonderful stay and would definitely come back! The owners are absolutely amazing. The property is beautiful, safe, and includes water access, private nature trail, indoor/outdoor sitting areas, and all the worldly amenities of modern society wrapped up in a serene shell. Nearby there is access to grocery, gas, hiking, and a short drive from charming Old Quebec. Our experience was magnificent and we highly recommend staying here. Nature's Haven is seasonally available every year from June to September.